Don’t gamble with the success of your wedding day! Avoid leaving guests waiting in a bar for ages with nothing to do. Come back to a buzzing room full of laughter and chatter after the photo shoot. 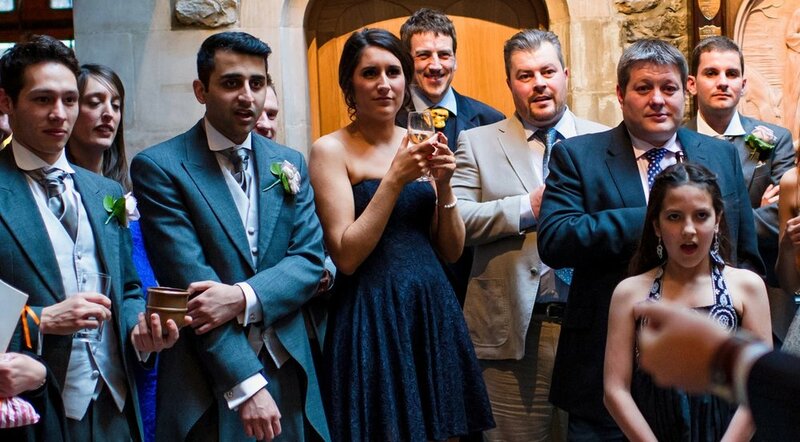 You're getting married and, if you're reading this, you'll probably be getting stuck into organising your special day. If you haven't already, you'll find very quickly that there's an awful lot more to organise than you may have first expected. There are the obvious things to sort out like the venue, the cake and the photographer, the invitations, choosing your first dance and of course the dress fittings and alterations. When you're having fun with all of the above, It's very easy to forget some very important things such as planning for UK weather, making sure there are enough vegetarian/vegan food options, organising plenty of soft drinks for guests that are driving, everything staying on time and how to stop your guests getting bored while you're off having your photographs taken. One aspect that's often overlooked is guest entertainment. 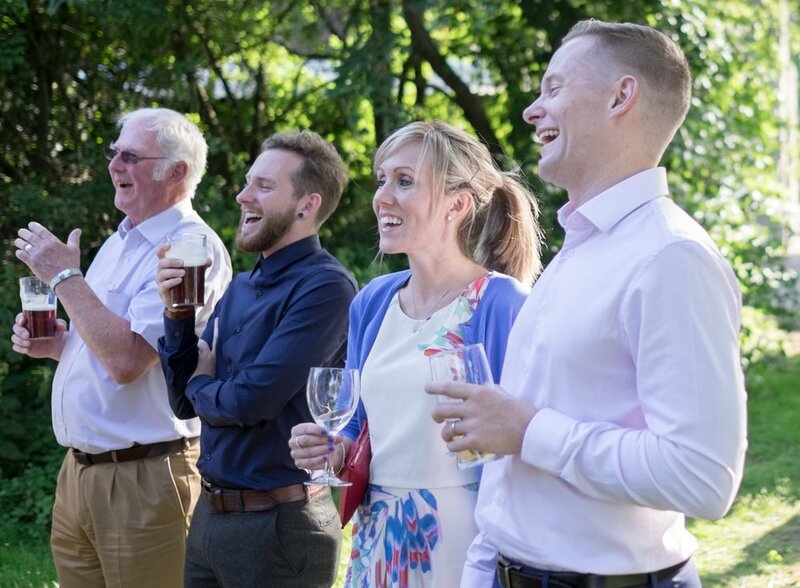 Whilst you'll be busy having your photographs taken, your guests will be eagerly awaiting your return – and attention, with nothing but a bar to keep them occupied. This can lead to some guests getting too drunk too early and risks upsetting the positive atmosphere. Not all of your guests will have met each other and some will find it harder than others to spark up a conversation with people they don't know. This is an ideal time for me to mingle amongst your guests, approaching small groups breaking the ice and bringing everyone together. I make them laugh, amaze them with visual magic that happens right in front of them and in their own hands and give them a real talking point. This ensures there's a warm buzzing glow in the room upon your return. Your photographer is able to get some amazing reaction shots of you and your friends and family enjoying the magic, laughing and having fun together. It also has the useful side effect that people don't reach for alcohol to help them through any awkward social situations. To get guests into their seats quickly and keep them there, I stop performing just before they are to be seated. While guests are being seated I will come and perform a personal magic effect just for the two of you as you wait outside. Between courses, I then approach each table with a personal mini show. Guests will remain in their seats for fear of missing out on their personal table show, allowing staff to serve food and clear the tables more quickly. It's also an excellent way to keep conversations flowing with everyone having a great time. Let's face it, you can only hold a conversation about table decorations for so long. Keeping a wedding running on time is not easy but I can help. If guests are unable to hear announcements clearly they'll simply ignore them. This means wasting valuable time herding everyone into the dining area for the wedding breakfast. Other hold-ups occur when guests interfere with the seating plan, or start wandering between tables between courses. Guests not being seated quickly can upset the entire itinerary but more importantly it leaves you both waiting around outside, before making your first entrance as the happy couple. This is the perfect time for me to perform a cabaret show to shake things up a little. The show is packed with intelligent humour and plenty of audience participation. My performance will leave your guests excited and energised, ready to enjoy the rest of your special day with you. Guaranteed not only to have them in stitches of laughter throughout, this show will have them talking about your wedding for years to come. It also frees the staff up to turn over the room. Once the carbohydrates have kicked in, and the alcohol takes its toll, it can cause a bit of a 'lull'. At this point you still have a lot planned, like the cutting of the cake, the first dance and the arrival of your evening guests. This means the staff will need to change the room around for the arrival of your evening guests and the rest of the day's proceedings. It's not about the tricks! With over 12 years experience as a wedding magician, I've performed at literally hundreds of weddings and I've seen what works and what doesn't. I will work closely with your photographers, videographers and your wedding coordinator to make sure everything runs smoothly and that you have the amazing wedding day that you deserve. At the heart of what I do is a simple idea. For a few magical moments, I'm able to turn adults into kids again, giving them a sense of wonder, making them laugh uncontrollably and making them forget their adult world of responsibility, work and stress for a short while. At this stage, the most important thing is to secure your special date in order to avoid disappointment, as dates get booked up very quickly and are strictly on a first come first served basis. To hold your date and get a proposal please click the button below. Once your date is secure I'll get in touch with you to discuss your enquiry and send you a proposal with my booking formats and fees. I'll keep in touch with you leading up to the booking, in case you have any questions or would like to make any changes to your itinerary. All dates are strictly subject to availability and on a first come, first served basis.